For the second outing with the new sails, I used a rope bridle, instead of the previous wire version. 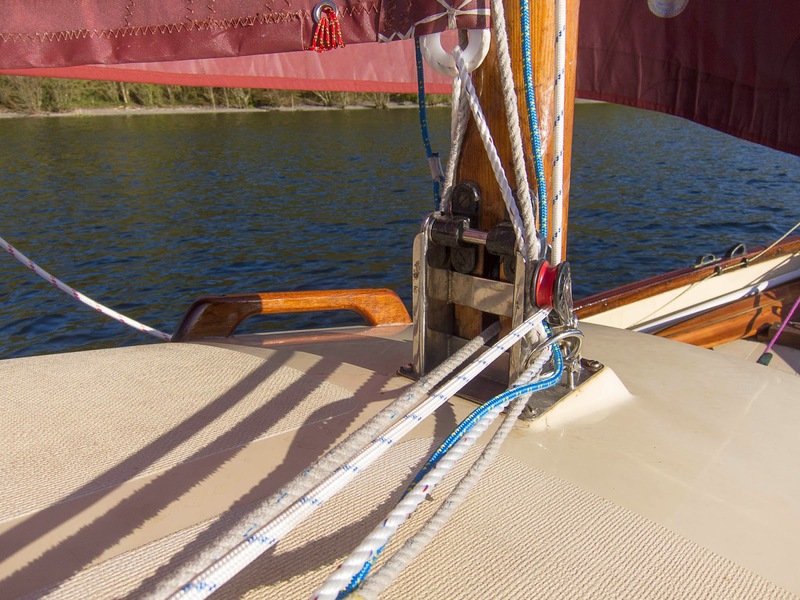 The rope is kinder to the wood spars. Although the rope version does stretch, it is not enough to cause any problems. 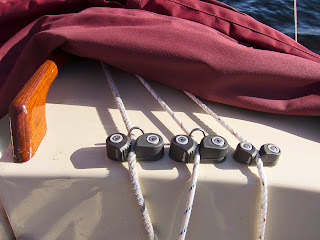 At the mast foot, I used a stainless ring for the three down haul lines. I'd replaced the pin on the tabernacle with a bolt, which had a machined dome head so it would not cause friction or wear on the ropes. With two halyards and three downhaul lines there was a need to change the cleating arrangements, These have proved quite easy to use. However, I feel the roes will wear, as they will cleat near the same place each time. 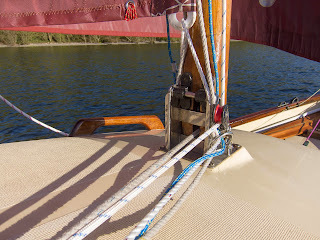 One solution would be to reverse the halyard during the season, so the wear is spread out. 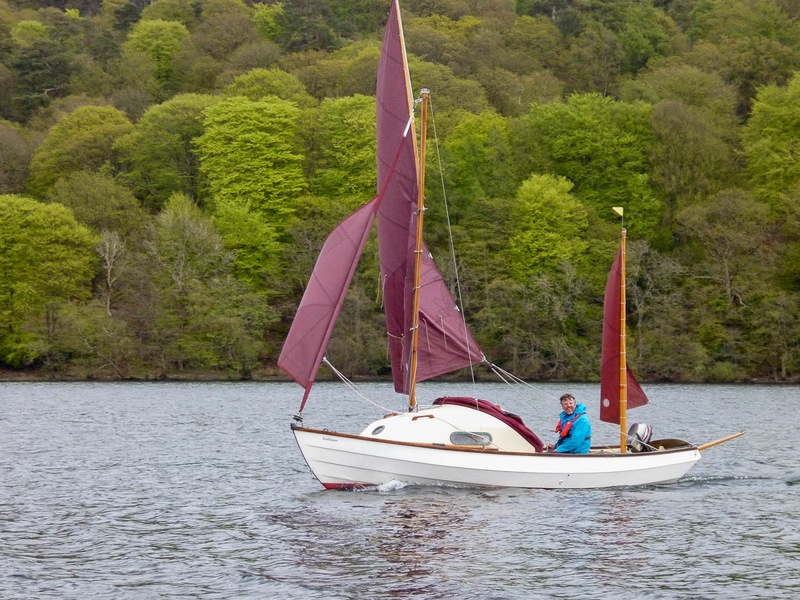 The sail does set very well and I have been very impressed with the quality of manufacture and attention to detail, such as the leech lines and leather wear patches where the mainsheet block is attached. 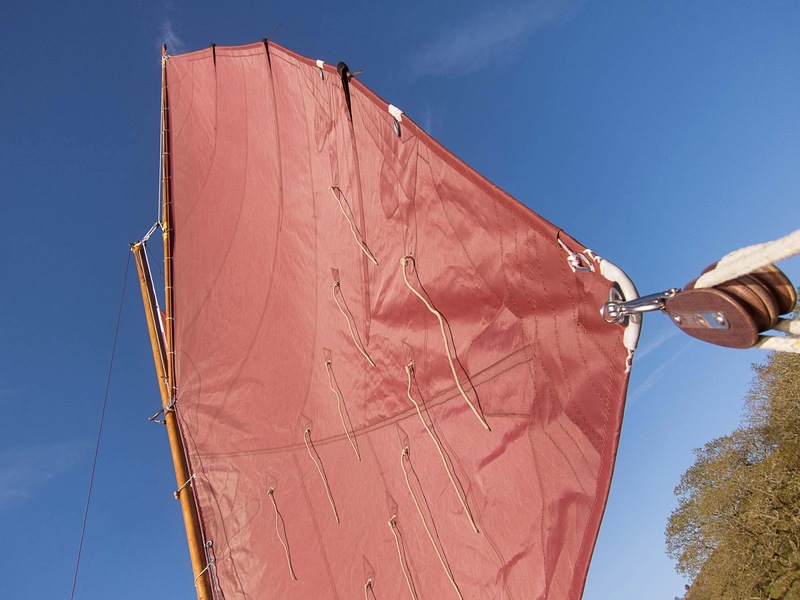 The sail is easy to handle and the second halyard allows the mainsail to be "scandalised", a traditional method for de-powering the mainsail. 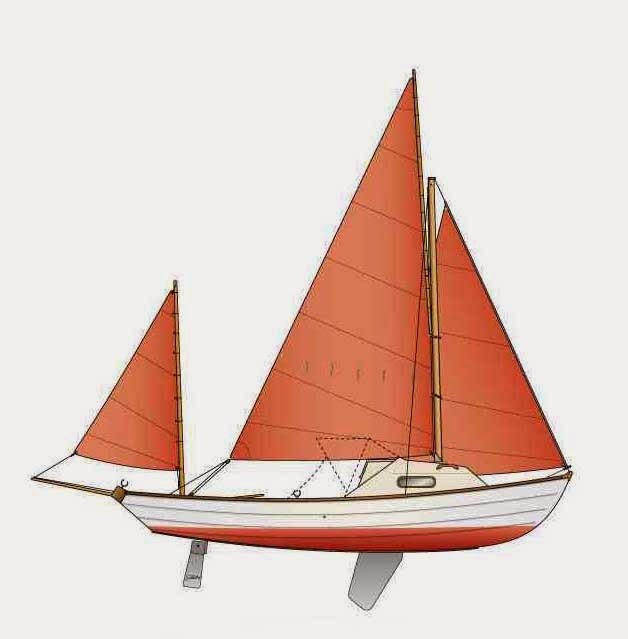 The second set of reefing lines has proved a necessity at times. Originally I planned to attach the new halyard for the gaff to the mast head via two shackles I'd fitted just below the shrouds. 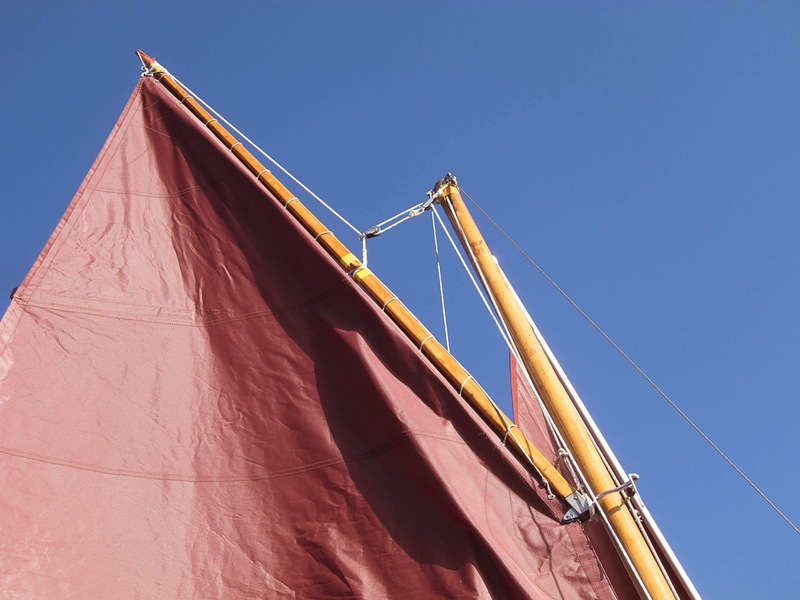 However, on the first sail it was noticeable that this would not work, as the pulley and shroud would rub. 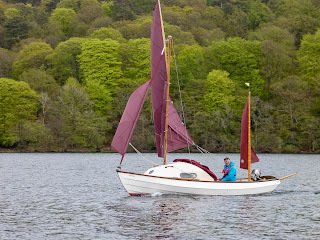 So as a temporary measure a piece of 8mm rope was fed through the shackles, knotted and tied around the front of the mast, under the forestay. 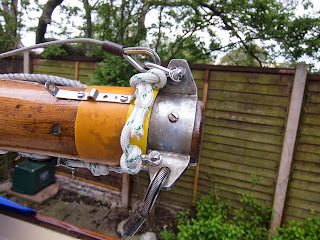 This seems to have worked quite well but I do have longer term ideas of bolting an additional eye to the mast head between the two shrouds. I'd wrapped a thin piece of polypropylene sheet (orange) around the mast to protect it from swinging pulleys etc.